We have two agreements for an individual consultant: this and Consultant contract: single consultant. This is a short version of the other. We have stripped out some of the detailed provisions which you may not need in less formal circumstances. This contract is suitable to use in any industry to establish your status as a consultant, as against that of an employee. The fact that the agreement comes from you and is not your client’s document, may assist in any argument with the South African Revenue Services as to your status. 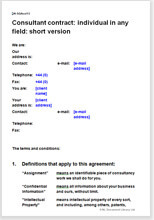 As you see from the subject list below, this agreement also provides full legal protection.